In Statements of Work (SOWs) we spend a lot of money while many products and services are bought. Oftentimes SOWs fail, causing delays, financial loss and other damages. Some SOWs written by a customer can be so unclear that acceptance testing is almost impossible. SOWs that are written by a vendor are often riddled with fuzzy words that shift all the risk to the customer. Additionally, vendors will use SOWs to modify key terms of a Master Agreement that inevitably put the customer at an increased disadvantage. Even customers with the best templates and negotiated SOWs still get burned by skilled vendors adept at managing the engagement and in turn, bypassing any written protections. 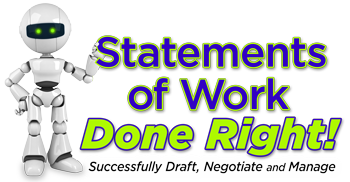 Are your SOWs written by the Vendors? to charge more and bust your budgets? Do you need to get control of your SOWs?